I like beer and babies. : Preggo my Eggo Update: 18 weeks down, 22 to go. So the place where I work has a lot of places to go to get deliciously-horrible-for-you food. Funnel cakes, corn dogs, chicken strips, you name it (no, I am not a carney at the fair). It has over three places to get ice cream, alone. Here is one of my biggest pet peeves: when I ask someone to go for a walk to get ice cream with me and they reply, “I don’t need any but I will go with you to get some.” F*ck you. Yes, I want to take my fat a** to the ice cream stand and wolf down a hot fudge sundae while you sit there and watch me. Are you serious? Last time I was pregnant, I had a girl say she would go for ice cream with me only for us to get there and have this happen: I order my ice cream, turn to her to ask what she was getting and she replied, “Oh, nothing. I am lactose intolerant.” I kid you not, I seriously almost slapped her in the face and cried. It was the meanest thing anyone had ever done to me. I canceled my order, went back to my office and told her to never talk to me again. She thought I was overreacting. I still don’t really like her. That was two years ago. I think there should be some sort of pregnancy friendship clause. When the pregnant person wants to eat something, you have to belly up to the nacho bar with them. No questions asked. No talking about the calories or where all this fat will land on your body. Nothing. Just pass on the margarita, ask for an extra side of guacamole and start snarfing the 'chos along with your preggo amiga. That is what true friendship is. 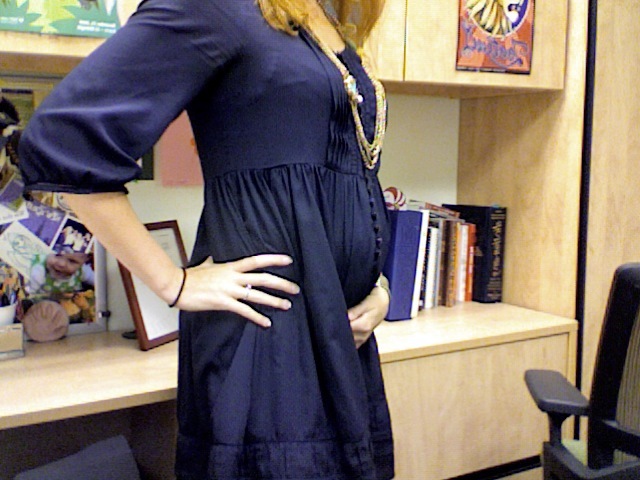 18-week update: I am just fatter because I eat ice cream five days a week. Lay off me, I’m starving. Shut the front door, I was just going to say how FREAKING GREAT you look. AND you have the CUTEST clothes? Is that a maternity dress? I always saw the CUTEST maternity clothes before I was pregnant and then when I got pregnant EVERYTHING I saw was the equivalent of a muu muu. What the hell? You look adorable. I say eat MORE ice cream. It seems to be doing you good! Ice cream is the true nectar of the gods. I'm glad you didn't slap that girl! Not good for the ol' workplace morale. And how much do I wish I worked with YOU?!?!?! We just have one crappy cafeteria that charges $7 for a disgusting sandwich and some limp fries.